The ASUS PCE-AC56 is an easy way to upgrade or add super-fast next-generation 802.11ac Wi-Fi to any desktop PC. 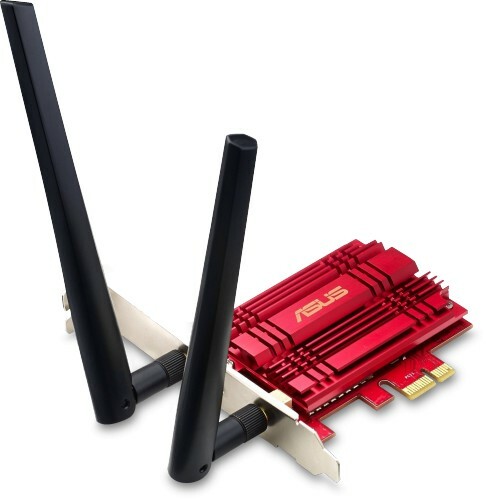 The ASUS PCE-AC56 is a 802.11ac Wi-Fi PCI Express adapter which upgrades your desktop from tangle-some Ethernet cables to carefree industry-leading 802.11ac at up to 867 Mbps. Broadcom TurboQAM technology super-charges 2.4 GHz 802.11n performance from 300 Mbps to 400 Mbps with compatible devices. Plus, the stylish external magnetic antenna base gives you more flexibility in adjusting antenna placement to get the best signal reception quality possible. The PCE-AC56 uses Broadcom’s new 5th generation Wi-Fi 802.11ac chipset to reach speeds of up to 867 Mbps through the 5 GHz band, which is three times faster than 802.11n Wi-Fi. 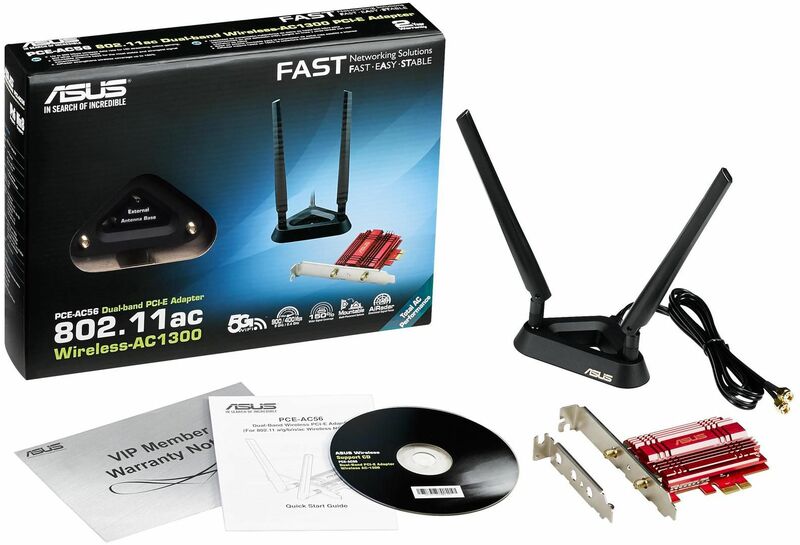 At the same time, it maintains full backward compatibility with all previous Wi-Fi protocols, providing high performance two-way transmission while ensuring a smooth transition to 802.11ac and seamless interconnection with existing devices. ASUS AiRadar intelligently strengthens wireless connectivity using 802.11ac beamforming technology, high power amplification, and exclusive ASUS RF fine-tuning. This ensures extended coverage, dynamic data speed increases and enhanced stability. No more dead zones with 150% better coverage! A powerful signal-boosting high-gain design gives the PCE-AC56 improved signal transmission that extends Wi-Fi range and coverage by up to 150% compared to generic client devices. This extended coverage minimises the possibility of dead spots at any location, offering fast and uninterrupted HD streaming and smooth multiplayer gaming throughout the home or office. With its PCI Express interface, the PCE-AC56 plugs into any motherboard to give the desktop an instant 802.11ac Wi-Fi upgrade, with access to speeds of up to 1.3 Gbps. As it connects directly to the motherboard, there are no messy cables to clutter your computing environment and no dedicated power supply is required. The added heatsink uses highly-conductive aluminium to remove heat from the chipset, ensuring greater reliability for non-stop operation. Lower temperatures translate into a more stable device in all climate conditions, even during hot summers and greater stability means more consistent connectivity and longer product lifespan. Plus, the heatsink has been crafted for a stylish look, once more showing that ASUS always goes beyond the spec. © 2000-2019 Quiet PC Ltd. If you have seen an error on this page, please let us know.